 Jordan NJ, Dutkowski CM, Barrow D, Mottram HJ, Hutcheson IR, Nicholson RI, Guichard SM, Gee JM. Impact of dual mTORC1/2 mTOR kinase inhibitor AZD8055 on acquired endocrine resistance in breast cancer in vitro. Breast Cancer Res. 2014 Jan 23;16(1):R12. Kleinert M, Sylow L, Fazakerley DJ, Krycer JR, Thomas KC, Oxb?ll AJ, Jordy AB, Jensen TE, Yang G, Schjerling P, Kiens B, James DE, Ruegg MA, Richter EA. Acute mTOR inhibition induces insulin resistance and alters substrate utilization in vivo. Mol Metab. 2014 Jun 27;3(6):630-41. Chresta CM, Davies BR, Hickson I et al. 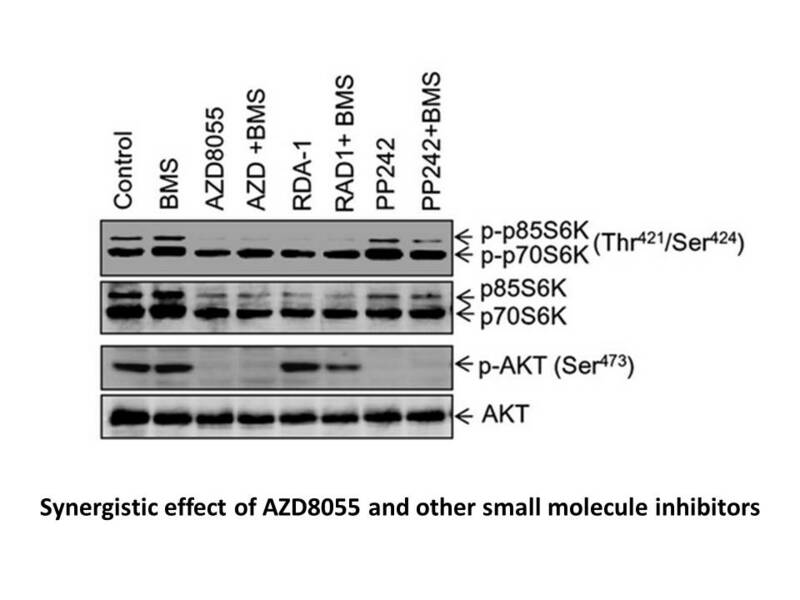 AZD8055 is a potent, selective, and orally bioavailable ATP-competitive mammalian target of rapamycin kinase inhibitor with in vitro and in vivo antitumor activity. Cancer Res 2010; 70: 288-298. Li S, Li Y, Hu R et al. 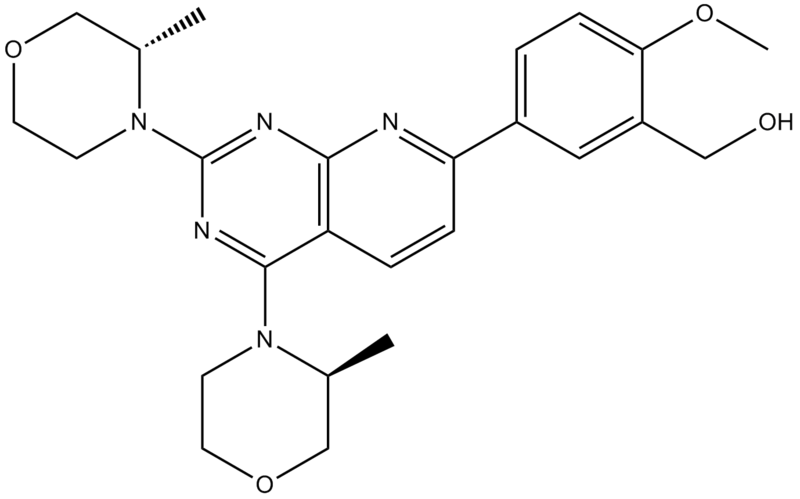 The mTOR inhibitor AZD8055 inhibits proliferation and glycolysis in cervical cancer cells. Oncol Lett 2013; 5: 717-721. Willems L, Chapuis N, Puissant A et al. 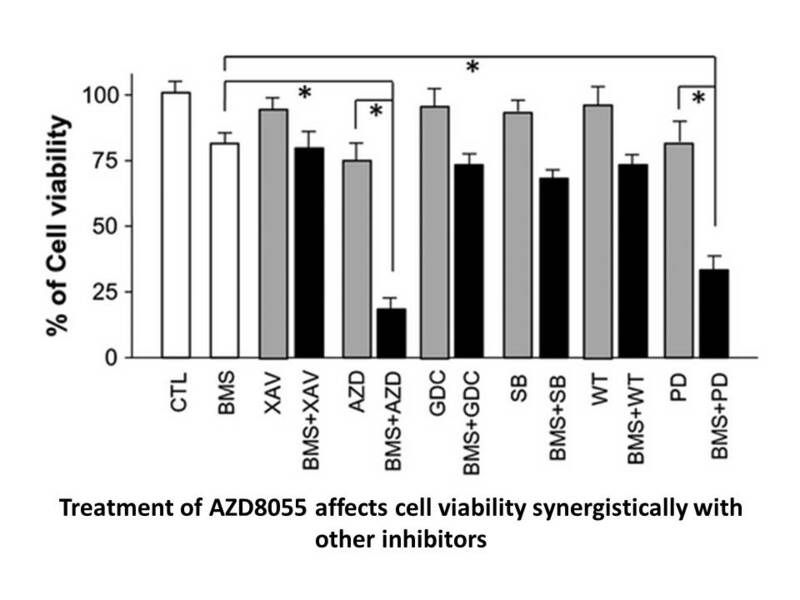 The dual mTORC1 and mTORC2 inhibitor AZD8055 has anti-tumor activity in acute myeloid leukemia. Leukemia 2012; 26: 1195-1202. Zhao L, Teng B, Wen L et al. 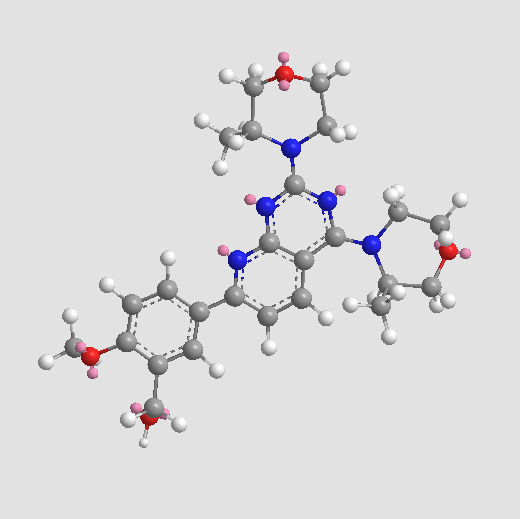 mTOR inhibitor AZD8055 inhibits proliferation and induces apoptosis in laryngeal carcinoma. Int J Clin Exp Med 2014; 7: 337-347. Li Q, Song XM, Ji YY et al. 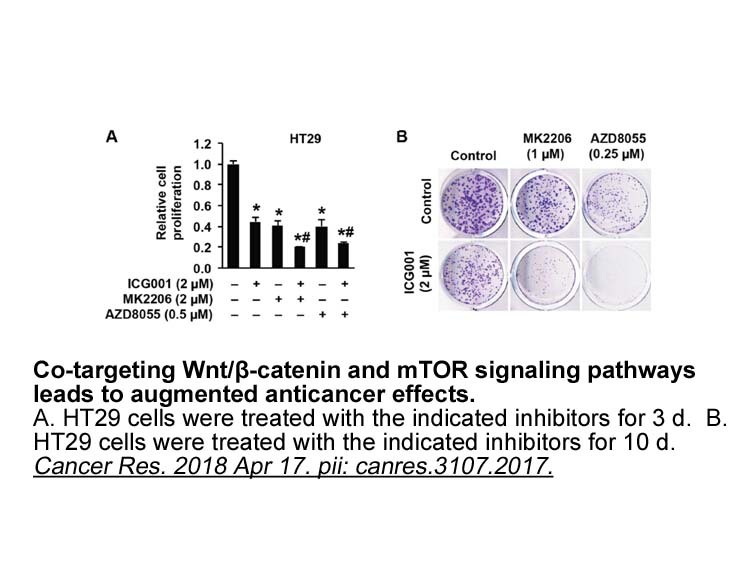 The dual mTORC1 and mTORC2 inhibitor AZD8055 inhibits head and neck squamous cell carcinoma cell growth in vivo and in vitro. 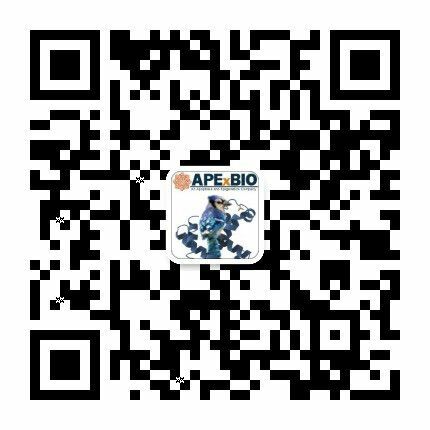 Biochem Biophys Res Commun 2013; 440: 701-706. Shao H, Gao C, Tang H et al. Dual targeting of mTORC1/C2 complexes enhances histone deacetylase inhibitor-mediated anti-tumor efficacy in primary HCC cancer in vitro and in vivo. J Hepatol 2012; 56: 176-183. Holt SV, Logie A, Davies BR et al. 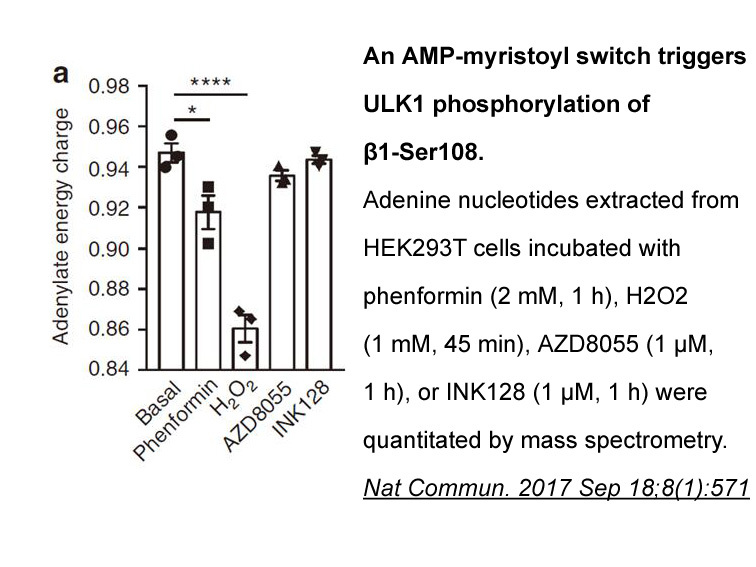 Enhanced apoptosis and tumor growth suppression elicited by combination of MEK (selumetinib) and mTOR kinase inhibitors (AZD8055). Cancer Res 2012; 72: 1804-1813. Renshaw J, Taylor KR, Bishop R et al. Dual blockade of the PI3K/AKT/mTOR (AZD8055) and RAS/MEK/ERK (AZD6244) pathways synergistically inhibits rhabdomyosarcoma cell growth in vitro and in vivo. Clin Cancer Res 2013; 19: 5940-5951. Asahina H, Nokihara H, Yamamoto N et al. Safety and tolerability of AZD8055 in Japanese patients with advanced solid tumors; a dose-finding phase I study. Invest New Drugs 2013; 31: 677-684. Naing A, Aghajanian C, Raymond E et al. Safety, tolerability, pharmacokinetics and pharmacodynamics of AZD8055 in advanced solid tumours and lymphoma. Br J Cancer 2012; 107: 1093-1099.